This course teaches you how to create basic schematic component libraries (.SchLib) and associated printed circuit board footprint libraries (.PcbLib). You will also learn how to create Library Projects (.LibPkg), Integrated Libraries (.IntLib) and Database Libraries (.DbLib). 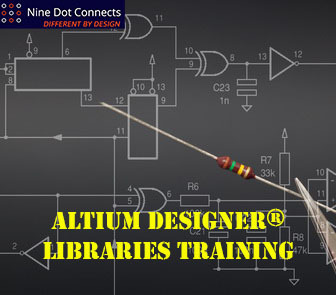 At the conclusion of the course, you will have a good understanding the types of libraries offered in Altium Designer and their configurations, in addition to component creation. This class can also be used as Day 1 of a 3-day Altium Designer Boot camp course for PCB development. Alternatively, it can also be used as Day 1 of a 2-day Library Training class, where day 2 introduces more advanced features. You will be provided with a training manual (103-pages).